Join our 7th Annual Membership Drive & Fundraiser to Support Mental Illness Research! It's Time For Our 7th Annual December Membership Drive and Charity Fundraiser! Support RPG Crossing and a good cause at the same time In the past several years combined, the RPG Crossing community has donated USD$4300 (USD$4650 if you count the extra 'bang for our buck' that we got the first year when our donations were matched by another generous donor) to the Brain and Behavior Research Foundation. 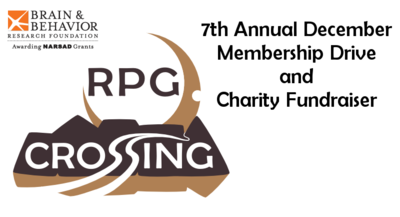 You can track our progress through announcements and information that will be posted at rpgcrossing.com, and through our event page for the BBR Foundation. How it works 1 - Effective immediately (Dec 2) and continuing until (and including) Tuesday, Jan 1, 2019, $5 of every new or renewed $25 one year Community Supporter membership will be donated to support mental illness research, via the Brain and Behavior Research Foundation. The foundation does its work by awarding research grants. 100% of your contributions for research are invested in research thanks to the generous support of two family foundations which cover the BBR Foundation's operating expenses. 2 - You can make a direct donation to the BBR Foundation through our event page for the BBR Foundation. Goals 1. If we beat $1000, we will add an extra month to the recipient of every one year Community Supporter membership purchased during the month of December. 2. If we reach USD$1571 in total donations to pass last year's total (including all direct donations and all $5 donations) we will add ANOTHER extra month to the recipient of every one year CS purchased during the month of December. Also -- there are lots of RPG goodies! Check them out! FAQ What is a Community Supporter account? We are committed to providing an excellent community to all members, but Community Supporters get some perks. Some of these are: a mobile style for easier reading on smaller devices, more private message space, a larger avatar, extensive folder management in games, the Community Supporter badge, access to the Community Supporter forum and its games & wish thread & private threads, nearly automatic game approval, and the warm feeling of knowing that you've helped keep the community going. For a more complete run down and chart, please visit the Community Supporter help page. How to purchase a membership for someone else: If you'd like to buy a CS membership for a friend, buy one on your account and send a pm to Birched -- he will transfer the year to the account of your choosing. Please indicate the exact username of the recipient, and whether you'd like the gift to be anonymous. How to purchase a membership with no credit card or PayPal: Credit card purchases can be made through PayPal even without an account (and if you don't want an account, don't fall for their attempt to get you to make one after you enter your payment information), but if that's not an option, memberships can also be purchased by cheque. Please send a pm to Birched for details. Can I make a donation to BBR Foundation through the site without buying a membership: Yes. Please donate through our campaign with BBR Foundation at this link. P.S. If you are a CS, you can hide the graphic I will be adding to the header in the same way that you can hide the Twitter and Google+ buttons.